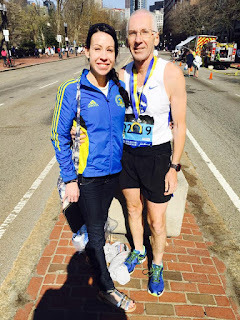 runjoey: Boston Marathon 2016. Making new memories. Boston Marathon 2016. Making new memories. I was really having a hard time feeling any enthusiasm in the last days leading up to this years trip to Boston but I was ready to open up a new chapter on this race and make some new memories. Only problems were I was under-trained and not too confident that my body was ready to hold up to the challenge. 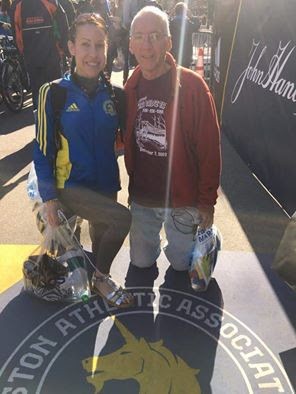 And then my training partner Laura , who was responsible for me even being able to go was staying home after 2 months of no running thanks to a persistent bout of pneumonia. Nope, not what I was hoping for at all. So, I hopped on the plane Sunday morning determined to make the most of it and give it my best shot and try to have a little fun. Words cannot describe the joy I felt when I landed in Boston and got a message from Laura that she was waiting for me at the expo ! What a wonderful surprise and my mood insantly changed a 100 shades brighter ! After a bit of a fiasco navigating the public transoportation system ( my fault, not theirs) I finally was able to meet her and pick up my race packet around 3:30. I had no need or desire to spend anytime in the expo so we went for any early dinner, got some photos at the finish line and then I headed back to my hotel to get some rest and make preparations for the next morning. With the 10:50 am start I had was in no rush and was able to sleep until my normal time despite having to get to the shuttle buses and then the ride out to Hopkinton. I wasn't really sure what to expect from the weather. Everytime I looked about every 12 hours for the days leading up to the race the forecast had changed. Now it was looking like a bit warm, close to 70. I'm glad I chose to go with a singlet ! Well, whatever the weather there was a race to be run. My plan was to take it easy for the first half and see what was left in the tank. I had a fantasy goal of running my new qualifying time of 3:55 and a more realsitic goal of sub 4 but finishing without dying and running my fastest of three Bostons would make me happy ! So what about the race? Everything went about as expected. It was getting very warm for the start and in fact the high for the day was about the time my wave started. That had me a bit worried so I was going to try to be a bit more conservative and make sure I began hitting the water stops early. The first downhill half mile was steeper than I remembered and although I was holding back it was still an 8:45 mile. I really had to go so at 1.7 I stepped off the road for a quick pee and then was back on my way again with mile 2 in 9:05. After that I was really consistent with the effort and the pace only varied a little to reflect the ups and downs. Even though it was warm I never felt like I was being stressed and in fact was feeling quite relaxed. I was amazed that my average over the next many miles was around 8:51, a bit under my needed qualifying pace and I was feeling like I was out for an easy joggy jog ! I was barely breathing unless I was going uphill ! Finally around mile 6 the wind started picking up a little bit and made it feel quite a bit cooler. I just relaxed and held steady trying to enjoy the surroundings and cheering fans while my pace stayed remarkably consistent. By mile 10 it was obvious that the temperature was dropping and I was feeling good and no longer worried about over heating. Now I was looking forward to the trip through Wellesley. Once again they didnt disappoint with loud cheering and offers for kisses. I picked out the prettiest young lady I could find , grabbed a quick kiss, thanked her and hurried along passing the half in about 1:55:30, a 2 minute cushion on my BQ pace ! It was still too early to try and push as the miles rolled by and my thoughts turned to the Newton Hills looming ahead. I was slowing slightly but still every mile was buildng more of a cushion. Until 17. A lot of uphill grade but no major hill and apparently I backed off the effort a bit too much with a 9:33 ! Bummer. and then mile 18 which includes the first real climb after making the turn at the Newton Fire house. I felt pretty strong and ran that mile in 9:11 and feeling confident I wasn't' going to blow up. How quickly things can change ! After mile 19 I crashed head first into the wall ! I didn't feel terrible, just no energy and my calves were shot. I was worried they would start cramping but thankfully they never did. Even the slightest upgrade and all power was gone. And I had forgotten how much more climbing there was until topping out at mile 21. So I just settled in, accepted what the situatioon was and tried to get it over with as little suffering as possible while still trying to run as much as I could. I can't say I like being passed by so many people over the last 5 miles but the crowds were wonderful. No qualifier or even sub 4 was coming today but I was going to finish and it was still going to be my fastest Boston by a long shot. as I crossed the line. I got a little emotional for just a second and was getting choked up but then I just started smiling as I accepted my finishers medal and made my way through the food and water tables. I was ready to get on my warm clothes from my gear bag and hurry over to meet Laura in the family meeting area. My phone wasn't working so I couldn't contact her. Luckily I was still feeling great and walking at a fast clip. Laura was already waiting when I arrived and was surprised to see me looking so fresh and moving so well. We spent a little time getting a few pictures and then it was good bye as she had to get home to family and I had to catch the train back to my hotel. All of my 5k splits had been very even for the first 30k so I am very happy with how I paced myself. Considering the january injury and March upper respiratory infection I am more than pleased with the outcome. My time was 4:12:10 beating my 2011 horror of 4:33 ! Not sure if or when I will return but you never can tell. right now it is on to new adventures. Stay tuned ! Good job, Joey! You ran a great race. Umstead and Boston plus training and tapering.